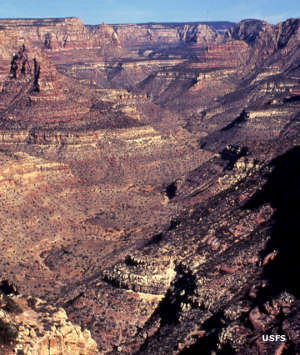 Dark Canyon Wilderness contains some 47,116 acres. The adjacent BLM-managed Dark Canyon Primitive Area contains about 65,000 acres that run between Dark Canyon Wilderness and Glen Canyon National Recreation Area. The place earned its name from the steep, narrow canyons where the sun hardly ever reaches to the canyon floors. This is an area that saw extensive occupation by the Ancestral Puebloans (Anasazi) up until about 800 years ago. I don't know if they came for the beauty or what but this is a remote area of the Colorado Plateau where colorful, sculpted walls of Cedar Mesa sandstone rise from the canyon bottoms to the heights of Dry Mesa. In among the canyons you''re liable to come across rock art, structural remains and other artifacts that the Ancestral Puebloans left behind when they abandoned this area. The high country in this area is a mix of Ponderosa pine and aspen that drops down through the juniper-pinon pine woodland to barren desert scrub. The canyons themselves have terraced, castle-like walls that rise up to 3,000'' above the canyon floors. You'll come across hanging gardens, arches, meadows, old-growth stands of Ponderosas and a very few springs and seeps (hint, hint). While hiking around out here, bring all the water you think you''ll need and then some. For wildlife you'll find mule deer, black bear, elk, wild turkey, mountain lion and bighorn sheep. To get there, you need to find your way up onto the Elk Ridge Highlands. From there, there are 10 different trail heads that feed down into Dark and Woodenshoe Canyons and their tributaries. In years with heavy snowfall, the roads may be blocked into early summer. And even if you find one of the essentially unmarked (and unmaintained) trails, that doesn't mean that you'll be able to follow it. The trails are all rated as "moderate" but that doesn't take into account the dearth of maintenance and traffic (that by itself would help to mark and maintain the trails). So you'll want a good, detailed map and a good compass (perhaps a GPS device). As the trails all start at the top of the canyons, once you reach the bottom, it's pretty much a no-brainer to follow the canyon through the rest of its length. There is a junction between Dark and Woodenshoe Canyons just before you leave the wilderness, and you might consider hiking back up through the other canyon to get back to where you left the car. Or you can keep going downhill and exit the wilderness into the BLM-managed Dark Canyon Primitive Area. On the other side of the Primitive Area is the Colorado River, although if there is any water in Lake Powell you may have to deal with that.